A couple of months ago, Hyphen Press released a collection of articles, reviews, short journalistic pieces and obits by critic and historian Tanya Harrod. 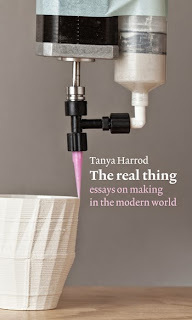 Called The Real Thing: Essays on making in the modern world, it's a very dense and thoroughly enjoyable edition of short writings Maupassantian in brevity and polish. I've been a Harrod fan for years, even subscribing at eyewatering expense to Crafts magazine just to be able to read her monthly column - until I realised I could read the copy at the School of Art library. But there are many pieces of her writing I couldn't access as they appeared in British papers and magazines, some prior to the internet and some simply because the paper or magazine doesn't place all of its content online. So The Real Thing is all the more joyful as it brings together what Harrod has herself determined to be important, interconnected and about "areas of facture that generally go unnoticed by art critics and which are rarely considered by writers on design and architecture", delivered with Harrod's breadth of knowledge which she shares with elan and wit. 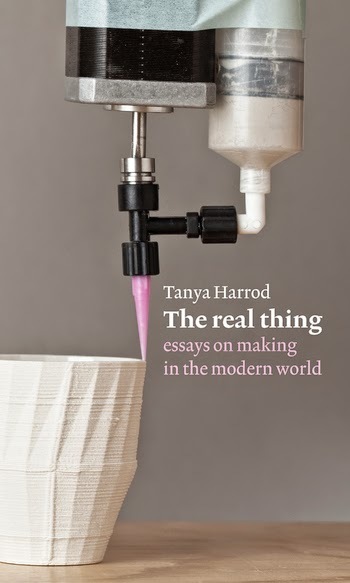 And this is what Harrod does so well - write about craft with deep insight (she trained as a potter) and deep love of all of our arcane and evolving practices with the warp and weft of that particular British radicalism which some social historians instill in their work. My first readings of her work made the same impact as reading AJP Taylor had when I was just starting to engage with history with some seriousness at uni. My copy of the book is pockmarked with underlinings, bent and crumpled post-it notes. Reading her work is, though it doesn't make sense that it is, it is nevertheless seemingly an exchange as Harrod is generous in her knowledge and ability to write about art where so many write to obscure that in plain sight, so that you become a willing accomplice in her view of a world of meaning, of making, of purpose, of true worth. The reverse of Wilde's aphorism about knowing the price of everything and the value of nothing. Is that why craft matters? That it has some worth which eludes pricing but embodies value which we intrinsically recognise? Well not all of us*, but as Grayson Perry or Colin Painter have shown, people who most of the artworld gate keepers would see as unworthy of attention can be brought into the conversation and contribute and embrace the made, the crafted. If that's the case (and it's perhaps an empty argument but this is my polemic and I'll polemic if I want...) then to push this analogy off the cliff of reasonableness, is design now about being very knowing of the price of everything? I'm currently reading Deyan Sudjic's B is for Bauhaus which Penguin published last year (which I bought from one of only two independent bookshops left in Canberra - Book Passion which gamely sits among the greengrocers, fishmongers, butchers, bakers, poultrymongers, health food shops and cafes at Belconnen Markets). Sudjic is the director of the Design Museum in London and has written widely, being one of the editors of Blueprint in the 80s. B is for Bauhaus (shouldn't it be bauhaus?) started as a dictionary of design but morphed into a batch of short essays - 39 in all - covering a board range of designery topics from authentic to zip. There is something paper dry about architectural writers and critics; reading them can be like walking on a windy hilltop. All the clouds of doubt and foggy aesthetics get blown away by a decent blast of cold hard truth. Or so they believe, but if ever there was an area of human endeavour that needed to be examined through the lens of social history, it's design. Sudjic's essay on bauhaus might usefully expose some of the accidental histories which helped establish both its reputation and model in so pre-eminent a fashion but he also ignores two key elements which do help justify its importance whilst so focused on the personality cult of great white male designer. Firstly, all of the staff from the completely bonkers Ittens to the unkind Mies van der Rohe were covetous in their engagement with the new materials and processes - from steel to early plastics, electro-plating, photography, industrial dyes and pigments. Explore, push, play, fail and repeat. Where Sudjic finds success in William Morris's design project when viewed as a critical design practice, he fails to apply the same logic to the work and pedagogy of bauhaus in all of its iterations. This duality, the exploration of materials and process and the finished object itself embodying a critique is one of the two most valuable gifts passed onto all subsequent makers, artists, craftspersons and designers. That their explorations further opened up industrialised manufacturing of domestic consumer wares is also overlooked (or ignored) by Sudjic. Whether it's a steel frame chair or ceramic tableware, the potential exploitation of newly industrialised materials and processes to make millions of the same object and profit for the manufacturer might have taken decades to reach maturation in Robin Day's Polypropylene Chair, but the notion that such a thing was both possible and desirable owes much to the serendipitous explorations of bauhaus associates and the parallel rise of materials and processes that could profitably make those objects. The question that Sudjic doesn't ask is to what degree promotion by corporations of their 'design icons' has ensured that they are exactly that - iconic and handily available for purchase which also ensures iconic status for the designer in our received histories. The other gift of bauhaus is the insistence on the hand, on making, on the experiential where the discovered and imaged potential of materials and new forms can be explored and validated by the maker or the designer, or both in conjunction. This is to some degree under threat as digital ways of both designing and making offer the opportunity to produce the previously unmakeable with now cheap 3-D printers, but few of these experiments are more than curiosities - like a two- headed calf or a dog that sings and plays the piano - diverting, funny or perhaps slightly scary, but not necessarily offering anything of lasting importance apart from technical development.. Which is not to invalidate that process - by no means, but I think we are playing with the limitations of digital world views and current technologies, cramped by linear realities which the hand and eye had overcome generations ago when we first fashioned exquisite stone tools, or wove materials into 3 D forms. We're captivated by our cleverness and blind to how infantile those accomplishments are. Craft builds on its vast storehouse of knowledge; too often design is seduced by generational newness, the art and practice of the amnesiac. * Our current Federal Minister of the Arts seems in particular to struggle with a definition of 'arts' that includes anyone other than a fur draped certainty last seen in 1950s Wagga Wagga.